Champion Plan PSA from Noube Productions on Vimeo. 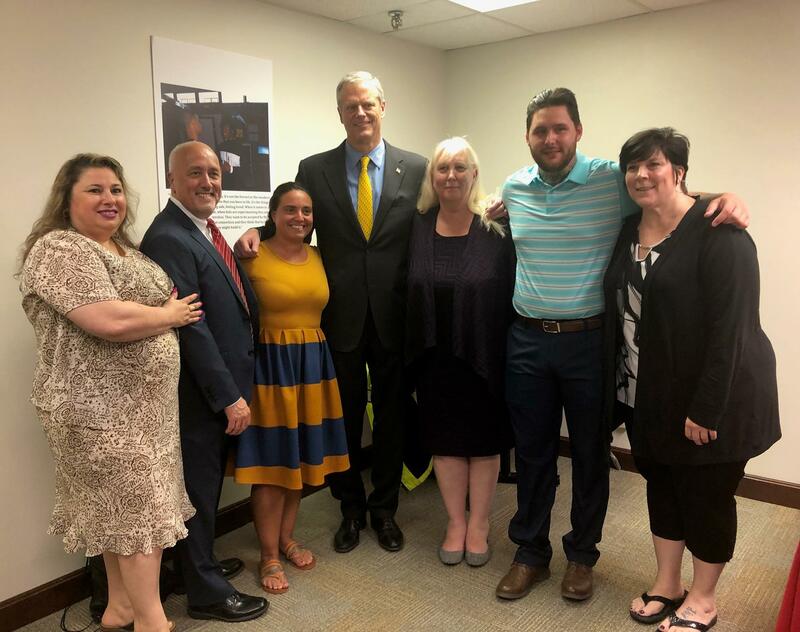 On Thursday June 28, Governor Baker, EOHHS Secretary Sudders, Commissioner Bharel, Mayor Bill Carpenter, police, fire and employees gathered at the Champion Plan in Brockton to announce that the city will be receiving $45,000 in funding to purchase naloxone. What is the Champion Plan? 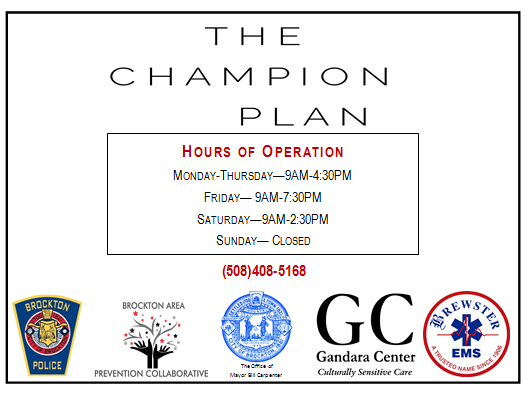 The Champion Plan is a police assisted recovery program in Brockton that launched on February 29, 2016. The plan is meant to help place individuals with substance use disorders (SUD) who want help into the level of care they want; detoxification, CSS, outpatient, Medically Assisted Treatment (MAT), etc. Modeled after a similar program in Gloucester, individuals suffering with a SUD asking for help will receive it. Brockton’s police headquarters will serve as the point of entry. The only way to enter the program is by going to the Police Department, where the police will assist the individual with a SUD and/or their family. 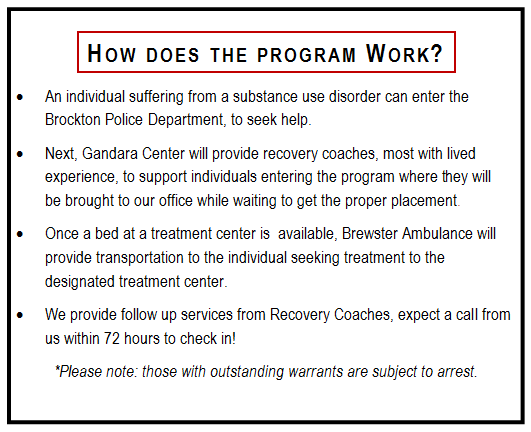 From there, Brockton-based non-profit, Gandara Center, will provide Recovery Coaches to support the people entering into the program. They will be taken to the Champion Plan Office, which will serve as a safe haven while they are waiting to get into a treatment facility or make their treatment plan. Once a bed at a treatment centers is available, Brewster Ambulance will provide transportation to the facility to begin their treatment. Who can enter the program? Any individual with a SUD who is seeking treatment is encouraged to take part in the Champion Plan. Non-residents of the city will be accepted. Even though the plan intends to serve all who ask for help, Brockton residents will be given preference. Be aware, those who have active warrants for their arrest will be placed in custody and have to go before the court before entering the program. By law, the police have to arrest those with outstanding warrants. From Feb 29, 2016-December 31, 2016 seven individuals were detained due to warrants and all seven returned to the program, five within three days. Once the warrants are cleared, individuals can enter the treatment program. People are asked to discard any drugs or drug paraphernalia before going into the police station. Where is the Brockton police station? The Police Department is located at 7 Commercial St. near downtown and between Court and Centre streets. The main entrance is at the top of a winding one-way ramp that also serves as a drop-off point for the downtown commuter rail station. Visitor parking is to the right of the building at the top of the ramp. People are asked to park in marked visitor spaces and to not block the road since it is used as an emergency road for the police. Those coming from Route 24 should get off at Exit 17A toward Brockton. Follow Belmont Street (or Route 123) for about three miles until the road ends at Main Street. Turn left onto Main Street and take your first right onto Crescent Street (Route 27). After about a quarter-mile on Crescent Street, turn left onto Commercial Street and look for the Police Department on your left. How does the plan differ from others? Each individual that comes through the Champion Plan is paired with a Recovery Coach that will follow up within 72 hours and help support and guide the individual through their journey as little or as much as they want it. Follow up will then occur after 1 week, 3 months, 6 months, 9 months, 1 year, 16 months, 20 months and 2 years. Once you enter the program, you are part of the Champion Plan family! Since March 1,2016 Champion Plan Recovery Coaches have completed 5,022 follow-up contacts, awesome job Champion Plan staff!! Between 2/29/16 and 6/30/18 there were 591 unique participants that produced 931 intakes. —258 (44%) of participants are between the ages of 25-34. —Homelessness is a major risk factor for this population. Over half (334 or 57%) of the participants were homeless as of the latest intake on file with the program. —Of the 452 recorded responses, over two-thirds, 61% of the participants reported their drug of choice as some form of opiate including Heroin, Percocet, Fentanyl, and the generic term Opiates. —409 (69%) participants were male and 182 (31%) participants were female. —A large majority of participants , about 88%, were placed into detox and the other 12% into other services such as CSS and outpatient. —There were 5,022 follow-up contacts completed between February 29, 2016 and June 30, 2018. —A “follow-up” represents a predefined post-intake phone call between Champion program staff and clients who have agreed to post-intake communications. Predefined follow-up periods occur at 72 hours, 1 week, 1 month, 3 month, 6 months, and 9 months, 12 months, and 16 months. —Of those 5,022 successful follow-ups were made and it was recorded that roughly 54% of clients were still actively engaged and connected to the Champion Plan. —98% of participants reported they felt the Champion Plan staff treated them with respect and really cared about them.